In Christianity, God is the eternal being who created and preserves the world. Christians believe God to be both transcendent (wholly independent of, and removed from, the material universe) and immanent (involved in the world). Christian teachings of the immanence and involvement of God and his love for humanity exclude the belief that God is of the same substance as the created universe but accept that God incarnated as a man. 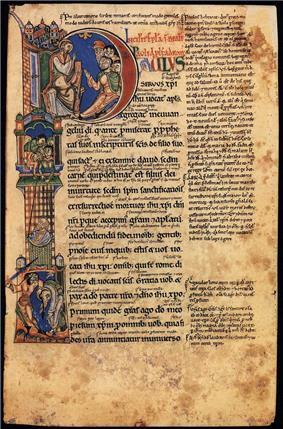 Early Christian views of God were expressed in the Pauline Epistles and the early creeds, which proclaimed one God and the divinity of Jesus, almost in the same breath as in 1 Corinthians (8:5-6): "For even if there are so-called gods, whether in heaven or on earth (as indeed there are many 'gods' and many 'lords'), yet for us there is but one God, the Father, from whom all things came and for whom we live; and there is but one Lord, Jesus Christ, through whom all things came and through whom we live." "Although the Judæo-Christian sect of the Ebionites protested against this apotheosis of Jesus, the great mass of Gentile Christians accepted it." This began to differentiate the Gentile Christian views of God from traditional Jewish teachings of the time. The theology of the attributes and nature of God has been discussed since the earliest days of Christianity, with Irenaeus writing in the 2nd century: "His greatness lacks nothing, but contains all things". In the 8th century, John of Damascus listed eighteen attributes which remain widely accepted. As time passed, theologians developed systematic lists of these attributes, some based on statements in the Bible (e.g., the Lord's Prayer, stating that the Father is in Heaven), others based on theological reasoning. The Kingdom of God is a prominent phrase in the Synoptic Gospels and while there is near unanimous agreement among scholars that it represents a key element of the teachings of Jesus, there is little scholarly agreement on its exact interpretation. Although the New Testament does not have a formal doctrine of the Trinity as such, it does repeatedly speak of the Father, the Son, and the Holy Spirit in such a way as to "compel a trinitarian understanding of God." This never becomes a "tritheism." This does not imply three Gods. Around the year 200, Tertullian formulated a version of the doctrine of the Trinity which clearly affirmed the divinity of Jesus and came close to the later definitive form produced by the Ecumenical Council of 381. The doctrine of the Trinity can be summed up as: "The One God exists in Three Persons and One Substance, as God the Father, God the Son and God the Holy Spirit." Trinitarians, who form the large majority of Christians, hold it as a core tenet of their faith. Nontrinitarian denominations define the Father, the Son, and the Holy Spirit in a number of different ways. for us there is but one God, the Father, from whom all things came and for whom we live; and there is but one Lord, Jesus Christ, through whom all things came and through whom we live. that they should seek God, if haply they might feel after him and find him, though he is not far from each one of us for in him we live. The Pauline Epistles also include a number of references to the Holy Spirit, with the theme which appears in 1 Thessalonians (4:8) "…God, the very God who gives you his Holy Spirit" appearing throughout his epistles. In John 14:26 Jesus also refers to "the Holy Spirit, whom the Father will send in my name". By the end of the 1st century, Clement of Rome had repeatedly referred to the Father, Son and Holy Spirit, and linked the Father to creation, 1 Clement 19.2 stating: "let us look steadfastly to the Father and creator of the universe". By the middle of the 2nd century, in Against Heresies Irenaeus had emphasized (Book 4, chapter 5) that the Creator is the "one and only God" and the "maker of heaven and earth". These preceded the formal presentation of the concept of Trinity by Tertullian early in the 3rd century. The period from late 2nd century to the beginning of the 4th century (approximately 180-313) is generally called the "epoch of the Great Church" and witnessed significant theological development, and the consolidation and formalization of a number of Christian teachings. From the 2nd century onwards, western creeds started with an affirmation of belief in "God the Father (Almighty)" and the primary reference of this phrase was to "God in his capacity as Father and creator of the universe". This did not exclude either the fact the "eternal father of the universe was also the Father of Jesus the Christ" or that he had even "vouchsafed to adopt [the believer] as his son by grace". Eastern creeds (those we know come from a later date) began with an affirmation of faith in "one God" and almost always expanded this by adding "the Father Almighty, Maker of all things visible and invisible" or words to that effect. As time passed, theologians and philosophers developed more precise understandings of the nature of God and began to produce systematic lists of his attributes (i.e., qualities or characteristics). These varied in detail, but traditionally the attributes fell into two groups, those based on negation (God is impassible) and those positively based on eminence (God is infinitely good). Ian Ramsey suggested that there are three groups and that some attributes such as simplicity and perfection have a different logical dynamic which from such attributes as infinite goodness since there are relative forms of the latter but not of the former. In Christian theology the name of God has always had much deeper meaning and significance than being just a label or designator. It is not a human invention, but has divine origin and is based on divine revelation. Respect for the name of God is one of the Ten Commandments, which Christians teachings view not simply an avoidance of the improper use of the name of God, but as a directive to exalt it, through both pious deeds and praise. This is reflected in the first petition in the Lord's Prayer addressed to God the Father: "Hallowed be thy Name". Going back to the Church Fathers, the name of God has been seen as a representation of the entire system of "divine truth" revealed to the faithful "that believe on his name" as in John 1:12 or "walk in the name of the Lord our God" in Micah 4:5. In Revelation 3:12 those who bear the name of God are destined for Heaven. 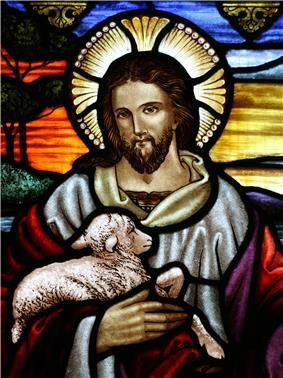 John 17:6 presents the teachings of Jesus as the manifestation of the name of God to his disciples. John 12:27 presents the sacrifice of Jesus the Lamb of God, and the ensuing salvation delivered through it as the glorification of the name of God, with the voice from Heaven confirming Jesus' petition ("Father, glorify thy name") by saying: "I have both glorified it, and will glorify it again" referring to the Baptism and crucifixion of Jesus. The Bible usually uses the name of God in the singular (e.g., Ex. 20:7 or Ps. 8:1), generally using the terms in a very general sense rather than referring to any special designation of God. However, general references to the name of God may branch to other special forms which express his multifaceted attributes. Scripture presents many references to the names for God, but the key names in the Old Testament are: God the High and Exalted One, El-Shaddai and Jehovah. In the New Testament Theos, Kurios and Pateras (πατέρας i.e., Father in Greek) are the essential names. The theological underpinnings of the attributes and nature of God have been discussed since the earliest days of Christianity. 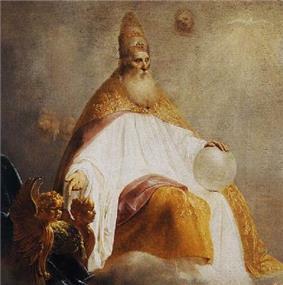 In the 2nd century Irenaeus addressed the issue and expounded on some attributes, e.g., in his Against Heresis (Book IV, Chapter 19) stated: "His greatness lacks nothing, but contains all things". Irenaeus based his attributes on three sources: Scripture, prevailing mysticism and popular piety. Today, some of the attributes associated with God continue to be based on statements in the Bible, e.g., the Lord's Prayer states that the Father is in Heaven, while other attributes are derived by theological reasoning. In the 8th century, John of Damascus listed eighteen attributes for God in his An Exact Exposition of the Orthodox Faith (Book 1, Chapter 8). These eighteen attributes were divided into four groups based on time (e.g., being everlasting), space (e.g., being boundless), matter or quality and the list continues to be influential to date, partially appearing in some form in various modern formulations. In the 13th century, Thomas Aquinas focused on a shorter list of just eight attributes, namely: simplicity, perfection, goodness, incomprehensibility, omnipresence, immutability, eternity and oneness. Other formulations include the 1251 list of the Fourth Lateran Council which was then adopted at Vatican I in 1870 and the Westminster Shorter Catechism in the 17th century. Two attributes of God that place him above the world, yet acknowledge his involvement in the world, are transcendence and immanence. Transcendence means that God is eternal and infinite, not controlled by the created world and beyond human events. Immanence means that God is involved in the world, and Christian teachings have long acknowledged his attention to human affairs. However, unlike pantheistic religions, in Christianity God's being is not of the substance of the created universe. Traditionally, some theologians such as Louis Berkhof distinguish between the communicable attributes (those that human beings can also have) and the incommunicable attributes (those that belong to God alone). However, others such as Donald Macleod hold that all the suggested classifications are artificial and without basis. There is a general agreement among theologians that it would be a mistake to conceive of the essence of God existing by itself and independently of the attributes or of the attributes being an additional characteristic of the Divine Being. They are essential qualities which exist permanently in his very Being and are co-existent with it. Any alteration in them would imply an alteration in the essential being of God. Hick suggests that when listing the attributes of God, the starting point should be his self-existence ("aseity") which implies that his eternal and unconditioned nature. Hick goes on to consider the following additional attributes: Creator being the source of all that composes his creation ("creatio ex nihilo") and the sustainer of what he has brought into being; Personal; Loving, Good; and Holy. Berkhof also starts with self-existence but moves on to immutability; infinity, which implies perfection eternity and omnipresence; unity. He then analyses a series of intellectual attributes: knowledge-omniscience; wisdom; veracity and then, the moral attributes of goodness (including love, grace, mercy and patience); holiness and righteousness before dealing finally with his sovereignty. 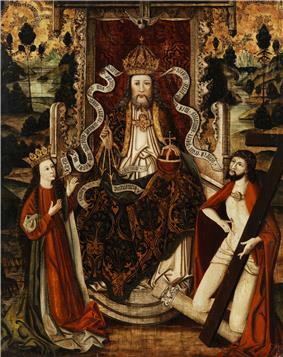 God the Father on a throne, Westphalia, Germany, late 15th century. The Christian characterization of the relationship between God and humanity involves the notion of the "Kingship of God", whose origins go back to the Old Testament, and may be seen as a consequence of the creation of the world by God. 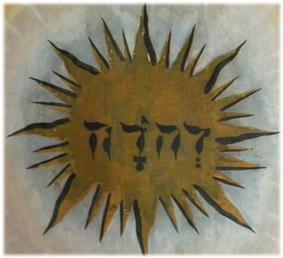 The "enthronement psalms" (Psalms 45, 93, 96, 97-99) provide a background for this view with the exclamation "The Lord is King". However, in later Judaism a more "national" view was assigned to God's Kingship in which the awaited Messiah may be seen as a liberator and the founder of a new state of Israel. The term "Kingdom of God" does not appear in the Old Testament, although "his Kingdom" and "your Kingdom" are used in some cases when referring to God. However, the Kingdom of God (the Matthean equivalent being "Kingdom of Heaven") is a prominent phrase in the Synoptic Gospels (appearing 75 times), and there is near unanimous agreement among scholars that it represents a key element of the teachings of Jesus. Yet, R. T. France points out that while the concept of "Kingdom of God" has an intuitive meaning to lay Christians, there is hardly any agreement among scholars about its meaning in the New Testament. Some scholars see it as a Christian lifestyle, some as a method of world evangelization, some as the rediscovery of charismatic gifts, others relate it to no present or future situation, but the world to come. France states that the phrase Kingdom of God is often interpreted in many ways to fit the theological agenda of those interpreting it. Interpretations of the term Kingdom of God have given rise to wide ranging eschatological debates among scholars with diverging views, yet no consensus has emerged among scholars. From Augustine to the Reformation the arrival of the Kingdom had been identified with the formation of the Christian Church, but this view was later abandoned and by the beginning of the 20th century the apocalyptic interpretation of the Kingdom had gained ground. In this view (also called the "consistent eschatology") the Kingdom of God did not start in the 1st century, but is a future apocalyptic event that is yet to take place. By the middle of the 20th century realized eschatology which in contrast viewed the Kingdom as non-apocalyptic but as the manifestation of divine sovereignty over the world (realized by the ministry of Jesus) had gathered a scholarly following. In this view the Kingdom is held to be available in the present. The competing approach of Inaugurated eschatology was later introduced as the "already and not yet" interpretation. In this view the Kingdom has already started, but awaits full disclosure at a future point. These diverging interpretations have since given rise to a good number of variants, with various scholars proposing new eschatological models that borrow elements from these. Hebrews 12:23 refers to "God the Judge of all" and the notion that all humans will eventually "be judged" is an essential element of Christian teachings. A number of New Testament passages (e.g., John 5:22 and Acts 10:42) and later credal confessions indicate that the task of judgement is assigned to Jesus. John 5:22 states that "neither does the Father judge any man, but he has given all judgment unto the Son". Acts 10:42 refers to the resurrected Jesus as: "he who is ordained of God to be the Judge of the living and the dead." The role played by Jesus in the judgement of God is emphasized in the most widely used Christian confessions, with the Nicene Creed stating that Jesus "sits on the right hand of the Father; shall come again, with glory, to judge the living and the dead; whose kingdom shall have no end". The Apostle's Creed includes a similar confession. In early Christianity, the concept of salvation was closely related to the invocation of the "Father, Son and Holy Spirit". Since the 1st century, Christians have called upon God with the name "Father, Son and Holy Spirit" in prayer, baptism, communion, exorcism, hymn-singing, preaching, confession, absolution and benediction. This is reflected in the saying: "Before there was a 'doctrine' of the Trinity, Christian prayer invoked the Holy Trinity". The earliest known depiction of the Trinity, Dogmatic Sarcophagus, 350 AD Vatican Museums. The term "Trinity" does not explicitly appear in the Bible, but Trinitarians believe the concept as later developed is consistent with biblical teachings. The New Testament includes a number of the usages of the three-fold liturgical and doxological formula, e.g., 2 Corinthians 1:21-22 stating: "he that establisheth us with you in Christ, and anointed us, is God; who also sealed us, and gave [us] the earnest of the Spirit in our hearts". Christ receiving "authority and co-equal divinity" is mentioned in Matthew 28:18: "All authority hath been given unto me in heaven and on earth" as well as John 3:35, John 13:3, John 17:1. And the Spirit being both "of God" and "of Christ" appears in Galatians 4:6, the Book of Acts (16:7), John 15:26 and Romans 8:14-17. "The Church ... believes in one God, the Father Almighty, Maker of heaven, and earth, and the sea, and all things that are in them; and in one Christ Jesus, the Son of God, who became incarnate for our salvation; and in the Holy Spirit". Around AD 213 in Adversus Praxeas (chapter 3) Tertullian provided a formal representation of the concept of the Trinity, i.e., that God exists as one "substance" but three "Persons": The Father, the Son and the Holy Spirit. In defense of the coherence of the Trinity Tertullian wrote (Adversus Praxeas 3): "The Unity which derives the Trinity out of its own self is so far from being destroyed, that it is actually supported by it." Tertullian also discussed how the Holy Spirit proceeds from the Father and the Son. The First Council of Nicaea in AD 325 and later the First Council of Constantinople in AD 381 defined the dogma "in its simplest outlines in the face of pressing heresies" and the version used thereafter dates to 381. In the 5th century, in the west, Saint Augustine expanded on the theological development in his On the Trinity, while the major development in the east was due to John of Damascus in the 8th century. 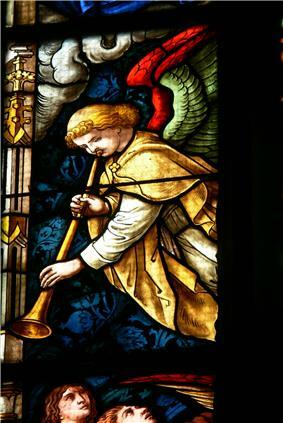 The theology eventually reached its classical form in the writings of Thomas Aquinas in the 13th century. Bernhard Lohse states that the doctrine of the Trinity does not go back to non-Christian sources such as Plato or Hinduism and that all attempts at suggesting such connections have floundered. The majority of Christians are now Trinitarian and regard belief in the Trinity as a test of true orthodoxy of belief. "The One God exists in Three Persons and One Substance." Strictly speaking, the doctrine is a mystery that can "neither be known by unaided human reason", nor "cogently demonstrated by reason after it has been revealed"; even so "it is not contrary to reason" being "not incompatible with the principles of rational thought". But the Godhead of the Father, of the Son, and of the Holy Spirit, is all one; the Glory equal, the Majesty co-eternal. To Trinitarian Christians (which include Catholic Christians, Eastern Orthodox Christians, and most Protestant denominations), God the Father is not at all a separate god from the Son (of whom Jesus is the incarnation) and the Holy Spirit, the other Hypostases of the Christian Godhead. The 20th century witnessed an increased theological focus on the doctrine of the Trinity, partly due to the efforts of Karl Barth in his fourteen volume Church Dogmatics. This theological focus relates the revelation of the Word of God to the Trinity, and argues that the doctrine of Trinity is what distinguishes the "Christian concept of God" from all other religions. Depiction of God the Father (detail) offering the right hand throne to Christ, Pieter de Grebber, 1654. The emergence of Trinitarian theology of God the Father in early Christianity was based on two key ideas: first the shared identity of the Yahweh of the Old Testament and the God of Jesus in the New Testament, and then the self-distinction and yet the unity between Jesus and his Father. An example of the unity of Son and Father is Matthew 11:27: "No one knows the Son except the Father and no one knows the Father except the Son", asserting the mutual knowledge of Father and Son. The concept of fatherhood of God does appear in the Old Testament, but is not a major theme. While the view of God as the Father is used in the Old Testament, it only became a focus in the New Testament, as Jesus frequently referred to it. This is manifested in the  And Jesus' emphasis on his special relationship with the Father highlights the importance of the distinct yet unified natures of Jesus and the Father, building to the unity of Father and Son in the Trinity. The paternal view of God as the Father extends beyond Jesus to his disciples, and the entire Church, as reflected in the petitions Jesus submitted to the Father for his followers at the end of the Farewell Discourse, the night before his crucifixion. Instances of this in the Farewell Discourse are John 14:20 as Jesus addresses the disciples: "I am in my Father, and you in me, and I in you" and in John 17:22 as he prays to the Father: "I have given them the glory that you gave me, that they may be one as we are one." In Trinitarian theology, God the Father is the "arche" or "principium" (beginning), the "source" or "origin" of both the Son and the Holy Spirit, and is considered the eternal source of the Godhead. The Father is the one who eternally begets the Son, and the Father eternally breathes the Holy Spirit. The Son is eternally born from God the Father, and the Spirit eternally proceeds from the Father, and, in the Western tradition, the Son. Yet, notwithstanding this difference as to origin, Father is one with, co-equal to, co-eternal, and con-substantial with the Son and the Holy Spirit, each Person being the one eternal God and in no way separated, who is the creator: all alike are uncreated and omnipotent. Thus, the Divine Unity consists of God the Father, with his Son and his Spirit distinct from God the Father and yet perfectly united together in him. Because of this, the Trinity is beyond reason and can only be known by revelation. Trinitarians believe that God the Father is not pantheistic, in that he not viewed as identical to the universe, but exists outside of creation, as its Creator. He is viewed as a loving and caring God, a Heavenly Father who is active both in the world and in people's lives. He created all things visible and invisible in love and wisdom, and man for his own sake. Stained glass window of Christ, Peter and Paul Cathedral, St. Petersburg, Russia. 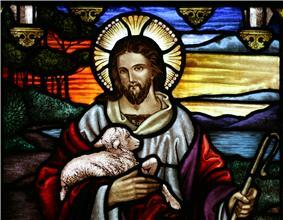 Since early Christianity, a number of titles have been attributed to Jesus, including Messiah and the Son of God. Theologically, these are different attributions: Messiah refers to his fulfilling the expected Old Testament prophecies, while Son of God refers to a paternal relationship. The third title, namely God the Son, is distinct from both Messiah and Son of God. Its theology as part of the doctrine of the Trinity was formalized well over a century after those. According to the Gospels, Jesus was conceived by the Holy Spirit and born from the Virgin Mary. The Biblical accounts of Jesus' ministry include: his baptism, miracles, preaching, teaching, and healing. The narrative of the gospels place significant emphasis on the death of Jesus, devoting about one third of the text to just seven days, namely the last week of the life of Jesus in Jerusalem. The core Christian belief is that through the death and resurrection of Jesus, sinful humans can be reconciled to God and thereby are offered salvation and the promise of eternal life. The belief in the redemptive nature of Jesus' death predates the Pauline letters and goes back to the earliest days of Christianity and the Jerusalem church. The Nicene Creed's statement that "for our sake he was crucified" is a reflection of this core belief. The two Christological concerns as to how Jesus could be truly God while preserving faith in the existence of one God and how the human and the divine could be combined in one person were fundamental concerns from well before the First Council of Nicaea (325). However, the theology of "God the Son" was eventually reflected in the statement of the Nicene Creed in the 4th century. The Chalcedonian Creed of 451, accepted by the majority of Christians, holds that Jesus is God incarnate and "true God and true man" (or both fully divine and fully human). Jesus, having become fully human in all respects, suffered the pains and temptations of a mortal man, yet he did not sin. As fully God, he defeated death and rose to life again. The Third Council of Constantinople in 680 then held that both divine and human wills exist in Jesus, with the divine will having precedence, leading and guiding the human will. In mainstream Christianity, Jesus Christ as God the Son is the second Person of the Holy Trinity, due to his eternal relation to the first Person (God as Father). He is considered coequal with the Father and Holy Spirit and is all God and all human: the Son of God as to his divine nature, while as to his human nature he is from the lineage of David. More recently, discussions of the theological issues related to God the Son and its role in the Trinity were addressed in the 20th century in the context of a "Trinity-based" perspective on divine revelation. 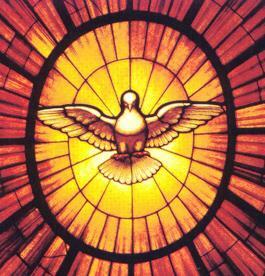 Stained glass representation of the Holy Spirit as a dove, Bernini c. 1660. In mainstream Christianity, the Holy Spirit is one of the three divine persons of the Holy Trinity who make up the single substance of God; that is, the Spirit is considered to act in concert with and share an essential nature with God the Father and God the Son (Jesus). The New Testament has much to say about the Holy Spirit. The Holy Spirit's presence was especially felt following the ascension of Christ, although not to the exclusion of an early presence as attested by the Old Testament and throughout the New Testament. :p.39 The Christian theology of the Holy Spirit, or pneumatology, was the last piece of Trinitarian theology to be fully explored and developed, and there is thus greater theological diversity among Christian understandings of the Spirit than there is among understandings of the Son and the Father. Within Trinitarian theology, the Holy Spirit is usually referred to as the "Third Person" of the triune God—with the Father being the First Person and the Son the Second Person. The  The participation of the Holy Spirit in the tripartite nature of conversion is apparent in Jesus' final post-Resurrection instruction to his disciples at the end of the Gospel of Matthew (28:19): "make disciples of all the nations, baptizing them into the name of the Father and of the Son and of the Holy Spirit". The Holy Spirit plays a key role in the Pauline epistles, to the point that their pneumatology is almost inseparable from their Christology. 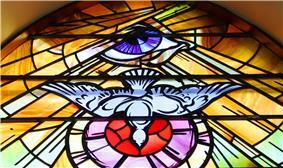 In the Johannine writings, three separate terms, namely Holy Spirit, Spirit of Truth and Paraclete are used. Reflecting the Annunciation in Luke 1:35, the early Apostles' Creed states that Jesus was "conceived by the Holy Spirit". The Nicene Creed refers to the Holy Spirit as "the Lord and Giver of Life" who with the Father and the Son together is "worshiped and glorified". While in the act of the Incarnation, God the Son became manifest as the Son of God, the same did not take place for God the Holy Spirit which remained unrevealed. Yet, as in 1 Corinthians 6:19 God the Spirit continues to dwell in bodies of the faithful. In Christian theology Holy Spirit is believed to perform specific divine functions in the life of the Christian or the church. The action of the Holy Spirit is seen as an essential part of the bringing of the person to the Christian faith. The new believer is "born again of the Spirit". The Holy Spirit enables Christian life by dwelling in the individual believers and enables them to live a righteous and faithful life. He acts as Comforter or Paraclete, one who intercedes, or supports or acts as an advocate, particularly in times of trial. He acts to convince unredeemed persons both of the sinfulness of their actions and thoughts, and of their moral standing as sinners before God. The Holy Spirit both inspired the writing of the scriptures and now interprets them to the Christian and/or church. In Eastern Orthodox theology, essence of God being that which is beyond human comprehension and can not be defined and or approached by human understanding. Roman Catholic teachings are somewhat similar in considering the mysteries of the Trinity as being beyond human reason. However, differences exist in that in Roman Catholic theology and teaching, God the Father is the eternal source of the Son (begot the Son by an eternal generation) and of the Holy Spirit (by an eternal procession from the Father and the Son) and the one who breaths the Holy Spirit with and through the Son, but the Eastern Orthodox consider the Spirit to proceed from the Father alone. Most Protestant denominations and other mainstream traditions arising since the Reformation, hold general Trinitarian beliefs and theology regarding God the Father similar to that of Roman Catholicism. This includes churches arising from Anglicanism, Baptist, Methodism, Lutheranism and Presbyterianism. Likewise, The Oxford Dictionary of the Christian Church describes the Trinity as "the central dogma of Christian theology". However, a precise representative view of Protestant Trinitarian theology regarding "God the Father", etc., is more difficult to provide, given the diverse and less centralized nature of the various Protestant churches. Some Christian traditions reject the doctrine of the Trinity, and are called nontrinitarian. These groups differ from one another in their views, variously depicting Jesus as a divine being second only to God the Father, Yahweh of the Old Testament in human form, God (but not eternally God), prophet, or simply a holy man. Some broad definitions of Protestantism include these groups within Protestantism, but most definitions do not. Nontrinitarianism goes back to the early centuries of Christian history and groups such as the Arians, Ebionites, Gnostics, and others. These nontrinatarian views were rejected by many bishops such as Irenaeus and subsequently by the Ecumenical Councils. The Nicene Creed raised the issue of the relationship between Jesus' divine and human natures. Nontrinitarianism was rare among Christians for many centuries, and those rejecting the doctrine of the Trinity faced hostility from other Christians, but the 19th century saw the establishment of a number of groups in North America and elsewhere. In Jehovah's Witness theology, only God the Father is the one true and almighty God, even over his Son Jesus Christ. While the Witnesses acknowledge Christ's pre-existence, perfection, and unique "Sonship" with God the Father, and believe that Christ had an essential role in creation and redemption, and is the Messiah, they believe that only the Father is without beginning. In the theology of God in Mormonism, the most prominent conception of God is the Godhead, a divine council of three distinct beings: Elohim (the Father), Jehovah (the Son, or Jesus), and the Holy Spirit. The Father and Son are considered to have perfected, material bodies, while the Holy Spirit has a body of spirit. Mormonism recognize the divinity of the Father, Son, and Holy Spirit, but believe they are distinct beings, united not in substance but in will and purpose, and they are each omniscient, omnipotent, and omni-benevolent. Other groups include Oneness Pentecostals, Christadelphians, Christian Scientists, and The New Church. ^ Perhaps even pre-Pauline creeds. ^ "TRINITY". Jewish Encyclopedia. JewishEncyclopedia.com. Retrieved 22 August 2013. ^ Peter Stockmeier in the Encyclopedia of Theology: A Concise Sacramentum Mundi edited by Karl Rahner ISBN 0860120066 (New York: Seabury Press, 1975) page 375-376 "In the following period, c. 180-313, these structures already determine essentially the image of the Church which claims a universal mission in the Roman Empire. It has rightly been termed the period of the Great Church, in view of its numerical growth, its constitutional development and its intense theological activity." ^ Donald Macleod, Behold Your God (Christian Focus Publications, 1995), 20-21. ^ a b Oxford Dictionary of the Christian Church (1974), Cross & Livingstone (eds), art "Trinity, Doctrine of"
^ a b Millard J. Erickson (1992). Introducing Christian Doctrine. Baker Book House. pp. 265–270. ^ The Holy Spirit and His Gifts. J. Oswald Sanders. Inter-Varsity Press. chapter 5. ^ T C Hammond; Revised and edited by David F Wright (1968). In Understanding be Men:A Handbook of Christian Doctrine. (sixth ed.). ^ Insight on the Scriptures 2. 1988. p. 1019. ^ Dahl, Paul E. (1992). "Godhead". In Ludlow, Daniel H. Encyclopedia of Mormonism. New York: Mcmillan. pp. 552–53. .
Jenkins, David. Guide to the Debate about God. London: Lutterworth Press, 1966.